April 27 is the 117th day of the year(118th in leap years) in the Gregorian calendar.There are 248 days remaining until the end of the year. 1861 – American President Abraham Lincoln suspends the writ of habeas corpus . Year 33 BC was either a common year starting on Saturday, Sunday or Monday or a leap year starting on Sunday of the Julian calendar and a leap year starting on Saturday of the Proleptic Julian calendar. At the time, it was known as the Year of the Consulship of Octavian and Tullus. The denomination 33 BC for this year has been used since the early medieval period, when the Anno Domini calendar era became the prevalent method in Europe for naming years. Lucius Marcius Philippus was a Roman politician who was elected suffect consul in 38 BC. He was step-brother to the future emperor Augustus. 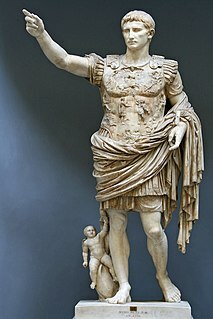 Augustus was a Roman statesman and military leader who was the first Emperor of the Roman Empire, controlling Imperial Rome from 27 BC until his death in AD 14. His status as the founder of the Roman Principate has consolidated an enduring legacy as one of the most effective and controversial leaders in human history. The reign of Augustus initiated an era of relative peace known as the Pax Romana. The Roman world was largely free from large-scale conflict for more than two centuries, despite continuous wars of imperial expansion on the Empire's frontiers and the year-long civil war known as the "Year of the Four Emperors" over the imperial succession. Year 85 BC was a year of the pre-Julian Roman calendar. At the time it was known as the Year of the Consulship of Cinna and Carbo. The denomination 85 BC for this year has been used since the early medieval period, when the Anno Domini calendar era became the prevalent method in Europe for naming years. Decimus Junius Brutus Albinus was a Roman politician and general of the 1st century BC and one of the leading instigators of Julius Caesar's assassination. Decimus Brutus is not to be confused with the more famous Brutus among the conspirators, Marcus Brutus, though he often is. Year 1468 (MCDLXVIII) was a leap year starting on Friday of the Julian calendar. Year 630 (DCXXX) was a common year starting on Monday of the Julian calendar. The denomination 630 for this year has been used since the early medieval period, when the Anno Domini calendar era became the prevalent method in Europe for naming years. Ardashir III, was king of the Sasanian Empire from 6 September 628 to 27 April 630. Year 1160 (MCLX) was a leap year starting on Friday of the Julian calendar. Saint Liberalis of Treviso is a saint of the 4th century. Tradition states that he was a priest who opposed Arianism and who worked to convert Arians and that he was persecuted at Ancona. Saint Rafael Arnáiz Barón, also named María Rafael in religion, was a Spanish Trappist conventual oblate. He studied architecture in Madrid, but decided to cease his studies in favor of the religious life. This was often interrupted due to his struggle with diabetes and his being called for active service. But these never hindered his religious call and he did as best as he could to deal with his diabetes through his constant life of reflection and writing on spiritual subjects in his letters. Anthimus of Nicomedia, was the bishop of Nicomedia in Bithynia, where he was beheaded during a persecution of Christians, traditionally placed under Diocletian, in which "rivers of blood" flowed. Saint Assicus(Asicus, Assic) was the first bishop of Elphin, Ireland, and venerated as the patron saint of that place. He was also an artisan metalworker. Floribert of Liège was a bishop of Liège, and a saint of the Catholic Church, celebrated on 27 April. He was the son of the French-born Hubert of Liège, also a saint, and succeeded on his death in 727. Wikimedia Commons has media related to April 27 . September 27 is the 270th day of the year in the Gregorian calendar. There are 95 days remaining until the end of the year. ↑ Pickthall, Marmaduke William; Asad, Muhammad (1 January 1975). "Islamic Culture". 49. 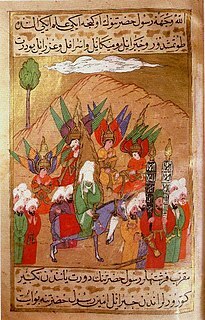 Islamic Culture Board: 196. Retrieved 13 April 2017.